NOTE: The Slider question type is unique because a default answer value will always be selected. Slider questions cannot be left blank. Preview: Displays the current question set-up. The preview updates after changes are saved. Question: Allows you to add question text and subtext. Behavior: Question settings. 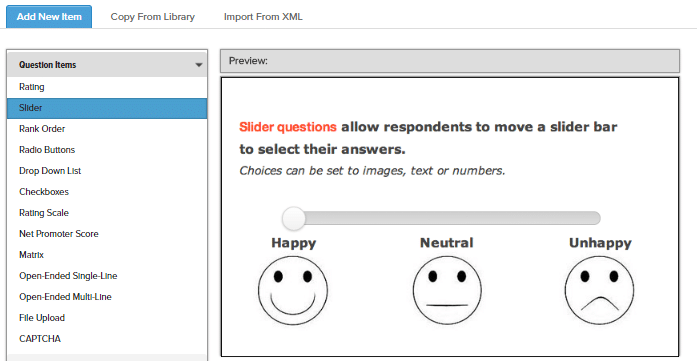 Behavior options vary among question item types. Choices: Possible answer options are entered here. The Choices tab is not applicable to all question items. Appearance: Question label and choice appearance settings. Appearance options vary among question item types. Conditions: Set item conditions. Consistent among question item types. The Preview tab shows a preview of how the question will appear in your survey. Type your question text into the HTML editor and use the HTML buttons to format the text or click the <> icon to edit the HTML directly. 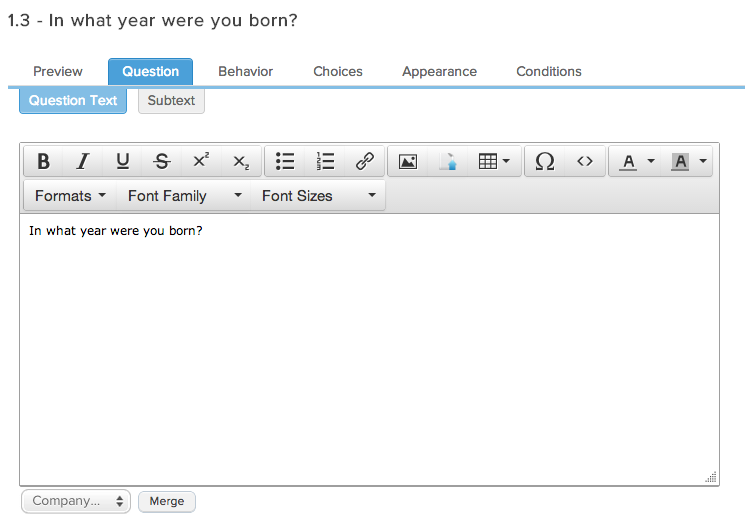 Merge in text from previous questions, User Attributes, or Response Properties using the Merge dropdown option. Enter subtext on the Subtext tab. *Note that options 2-5 in the image below are only available when you choose Number Range as the Value Type. Create a question alias. An alias acts as alternate question text and can be applied when generating reports or exporting response data. Set the Minimum Value (scale start value). Appears on the left side of the scale. Set the Maximum Value (scale end value). Appears on the right side of the scale. Determine the Step Size (number of values/points between scale markers). Entering ’1′ will increase the numeric scale by one point at a time as you drag the key across the scale from left to right (i.e. 0, 1, 2, 3…). Entering ’2′ will increase the numeric scale by two points at a time as you drag the key across the scale (0, 2, 4, 6…). Set a Default Value to determine where the key will be located on the scale when a respondent reaches the question. By default, the key will be positioned at the Minimum Value on the far left of the scale. If your Slider scale range is 0-100, setting a Default Value of 50 will place the key in the center of the scale. Your text answer choices and custom image choices are added on the Choices tab. *Note that this tab is disabled when you choose Number Range as your Value Type. Instead, use the Behavior tab to specify the number range of your Slider. When Image is selected on the Behavior tab, the images are uploaded on the Choices tab. Select the orange Upload button to upload your first item. After adding an image, select Set The Image. Next, create an alias for your image. A unique alias is required for all options when using images. The alias value for images will be shown when viewing reports or exporting data. Select the “+” icon to add your image. NOTE: You may upload up to 10 images per slider item. 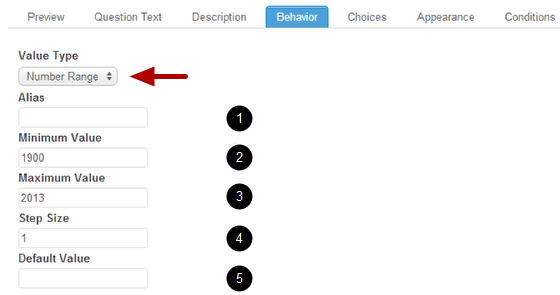 When Text is selected on the Behavior tab, the custom values are entered on the Choices tab. CHECKBOX TIP: Include “N/A” value if your Slider question doesn’t apply to all respondents and set this as the Default answer. Make changes to the appearance of questions and answers here. Set the Slider width in pixels. Checking the Show Value box will display the selected numeric value on the far left of the scale. As you move the Slider key from left to right, you will see the value change. 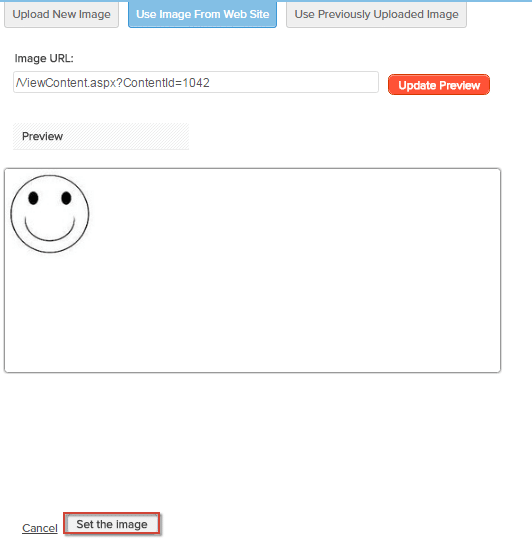 Set the image alias to display above images, below images, or to not show at all. Set the image position to display above or below the slider bar. When Text is selected as the slider type your only appearance option is to set the Slider width in pixels. Use conditional logic on survey items to ensure that a particular question will only display when certain conditions are met by the respondent. If no item conditions are set, the survey item will always* display in your survey. * Even if no item conditions are set, if one or more page conditions are set, the entire page may or may not display depending on whether certain conditions are met by the respondent. Items are subject to the conditions (if any) set to their page.